Issues with hair are seen in both men and women. There are various causes that can lead to losing hair in clumps. Hormones and other conditions like pregnancy can play a role in the falling out of hair. Here are the possible reasons for this, remedies and treatments. If you lose up to 100 hairs in a day, this is considered normal. On the other hand, if you lose more than that, then that is not normal. You might end up bald if you are a man but if you are a woman, you will realize that the hair on the top of your scalp becomes very thin. This can happen at any time of your life, but it has been shown more prevalent with increase in age. The loss of hair could be normal but could raise concern the moment it starts to change how you look. Studies have shown that about 35% of men suffer from massive loss of hair and this leads to baldness. This kind of clumpy loss of hair is known as alopecia. Androgenic alopecia is a hereditary condition causing hair thinning and loss in people. If any of your family members has the condition, then you are likely to also suffer the condition. Both men and women can suffer from androgenic alopecia. In men, hair is lost in a defined pattern right above the temples. This leaves you with an M-shaped appearance. Women may start to suffer receding hairlines, starting from the temples. The crown area also begins to thin out gradually, significantly reducing hair count over time. Adequate protein in your diet is important to bring about the growth of hair. It is therefore important for you to be very careful when dieting so as to have a diet that is all inclusive. 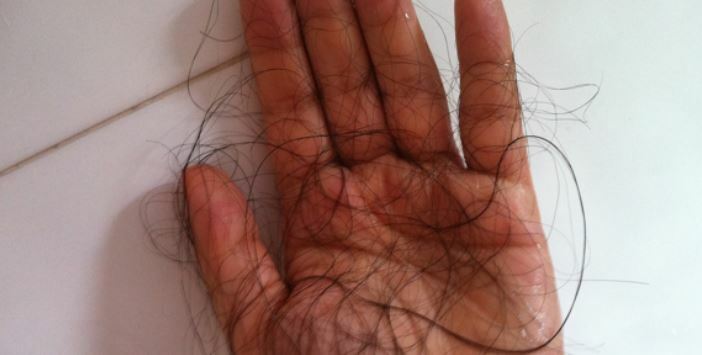 When there’s protein malnutrition, your body will shift growing hairs into the resting phase. If the problem persists for long, you may start noticing that you are losing hair in clumps or patches. Sometimes you may start to notice hair going down the drain in the shower. The possible cause is the lack enough iron that can facilitate the growth of hair. You are therefore advised to eat foods that are rich in iron. There are other reasons why you may have anemia and they include loss of blood, illnesses and pregnancy. Syphilis and autoimmune diseases can lead to iron deficiency and anemia and hence hair loss. Stress could change the manner in which you handle your hair. Similarly, it could change the amount of time that you spend on your hair. You should therefore make sure you have the best ways of handling stress in the event that it occurs. Sudden or unexplained weight loss may manifest its side effects in terms of clumps of hair falling out in the shower. Any light strain of your scalp will lead to the hair getting plucked out easily. Possible causes of sudden weight loss include cancer, HIV/AIDS, overactive thyroid, depression etc. Another possible reason your hair is falling out in clumps is bleaching or coloring. This does not happen in many people but there are times when bleaching causes hair damage. You may also experience other damages such as an itchy scalp from bleach and hair dyes. It is sold in the form of liquids or foam. You can apply the medication to your scalp two times in a day. It encourages regrowth and prevents the loss by inhibiting the hormone dihydrotestosterone (DHT). They contain a type of hormone and this brings down the immune system and hence getting rid of the loss of hair. They can be used in form of injections or creams and ointments. Injection is the most reliable for consistent prevention of hair loss. It is most important especially if you have hair loss as a result of menopause. It entails taking bouts of estrogen and progesterone as pills, creams or patches. It reduces the symptoms that come with menopause. This is a surgical procedure that is quite expensive, painful, invasive and may result into scars. It is a remedy that is likely to give you a longer lasting solution. It involves a light therapy that is done on a weekly basis about two or three times. You will have to carry on with the procedure for about 26 weeks for you to have results. The skin is exposed to light and this might pre-expose you to cancer if care is not considered. It blocks the formation of the hormone DHT, which kills the hair follicles thus leading to massive fall of hair. Intake of saw palmetto can therefore bring about steady growth of hair. Home remedies are as good as the medical treatments that help in doing away with the clumpy loss of hair. This is very important because it brings about improved blood circulation and flow to the roots of hair thus hair growth. Constant massage therefore can make your follicles more stimulated to produce more hair. Some of the oils that can be used include jojoba, castor, almond and mustard oil. It is a rich source of vitamin C and this makes it useful in facilitation of the growth and strengthening of hair. Further, vitamin C is important in the sense that it helps in the development of collagen, a protein that facilitates growth of hair. More to that, the vitamin is important in the absorption of the iron and hence keeping the roots of hair strong. Importantly, amla can prevent graying of hair. The juice has very strong antibacterial properties that are in preventing the new infections that bring about loss of hair. It is very normal for your dig to lose some hair. The excessive loss of hair is however not normal and could mean that there is an underlying condition, for instance allergies, hormonal imbalance, trauma or infections. There are different infections that will make your dog to have hair loss and they include ringworms, cancer and folliculitis. These kinds lead to the formation of nodules that might or might not have pus and then falling of hair. The disorders like thyroid disorders, pituitary dwarfism and adrenal glands deficiencies bring about the loss of hair in dogs. These disorders bring about the loss balance in the levels of hormones. When your dog licks its own fur, it brings about own induced trauma and this causes the loss of hair. The loss of hair after pregnancy is scientifically called Telogen effluvium. It is brought about mainly by the drop of the hormone called estrogen immediately after you give birth. There is some scientific evidence that points out that about 40 to 50 percent of women have temporary hair falling out after giving birth. Normally, when you are pregnant, the levels of the hormone estrogen are very high and therefore the amount of hair that falls is less than the amount that grows. You are therefore likely to have massive growth because the hormone stimulates the hair follicles. On the other hand, when you give birth, the levels of this hormone drop greatly. You are hence likely to have more hair that falls as compared to the much that grows. The loss is however likely to reduce and you will experience the same hair growth as before pregnancy 12 months after your pregnancy.